Recently, grade 8 students at Blackville School mixed literary activities with crime scene investigations. The students were working on a crime unit book club where they examined the role of science when cracking a case. Working in groups, the students were assigned a specific area of forensic science. After they read and discussed each crime, they were tasked to summarize their findings. At the end of the unit, students selected their best or favourite summary. They then redrafted the summary and used their final product to recreate a diorama of one of the crime scenes. 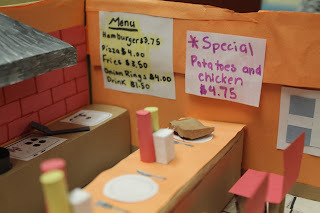 To see more photos of the students' dioramas, click here.